Located in the exclusive gated development of Colinas de Miramar, this Modern Home with Jaw Dropping Views is the property that you have been dreaming about. Less than a 10-minute drive to town and only 5 minutes to the beach, this ocean view home provides incredible elevated views while being close to all the action and amenities. 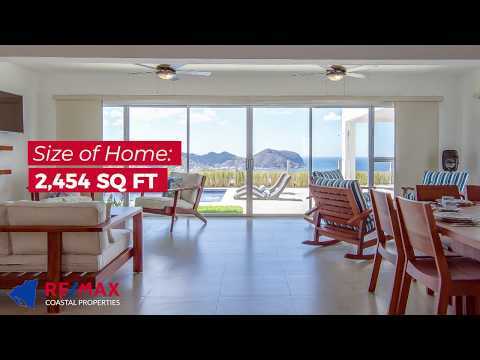 This 4 bedroom / 5 bathroom home is designed around the incredible views which are directly in your line of sight as you walk through the entrance of the home and look through the open living room and large outdoor space, which is divided by glass sliding doors. The ample living & dining area leads you to the patio which has a spacious pool, gazebo, outdoor shower, and half bath. Whether in the pool, reading under the shade of the gazebo on an oversized couch, or tanning in a lounge chair – the incredible views of town, the bay, and ocean surround you. The 2 larger bedrooms are on the western side of the home and have seamless access to the outdoor area via glass sliding doors. The other two bedrooms, each with their own bathroom, have great natural light from the eastern side of the home and contain multiple beds for large families or rental groups.